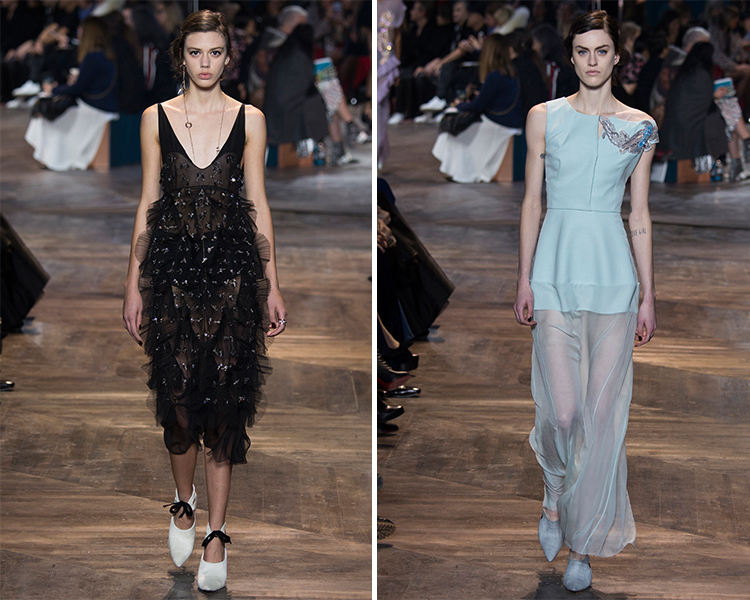 Okay, can we talk about how good the couture shows were this season? Seriously, I'm struggling editing down the looks I show because there was just so much goodness! It's a nice problem to have. Because there were so many standout looks and collections, I'm breaking my couture reviews into portions. 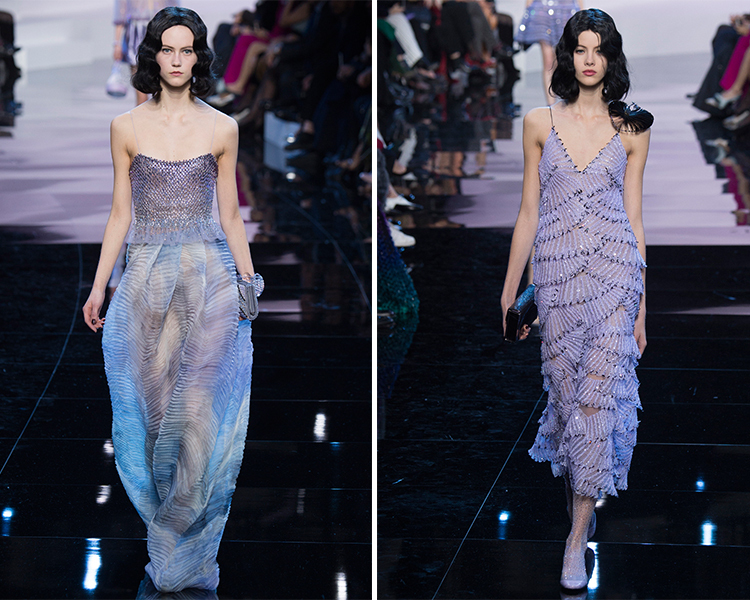 Today, I'm talking Armani, Chanel, and Dior. 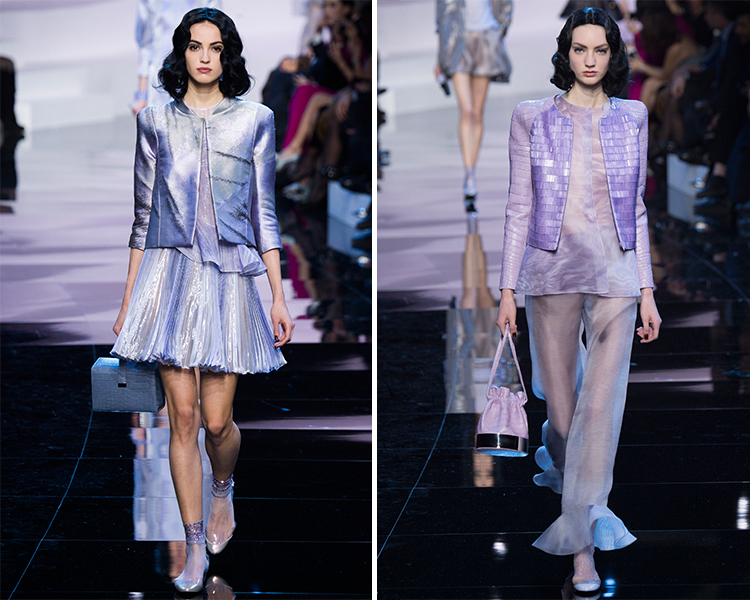 Giorgio Armani was in a purple haze, with a stunning monochromatic couture collection filled with lilacs and lavenders. But while monochrome may read as boring, the clothes were anything but. The cohesiveness of color allows viewers to focus on the shape and the texture of each garment, and really, that is the whole point of couture. It's about craftsmanship and quality, and keeping everything in the same color just eliminates things that might distract from our admiration of these garments. 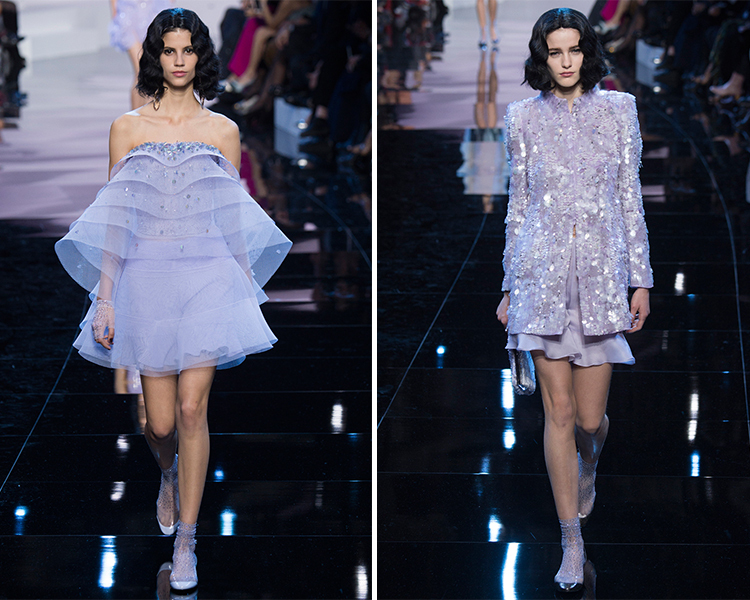 Before getting to the red-carpet-ready gowns that Armani Privé is known for, a full 28 looks of daytime separates paraded down the runway, echoing the modern sentiment that clothes, even couture clothes, should first and foremost be worn. What's a $100,000 dress if it can only be worn once and then never again? A bad investment, that's what it is. Of course, there were a number of gowns that I have already saved in my "Oscars Red Carpet Predictions" folder. I would love to see Brie Larson in the flapper-esque dress with the beaded scallops. 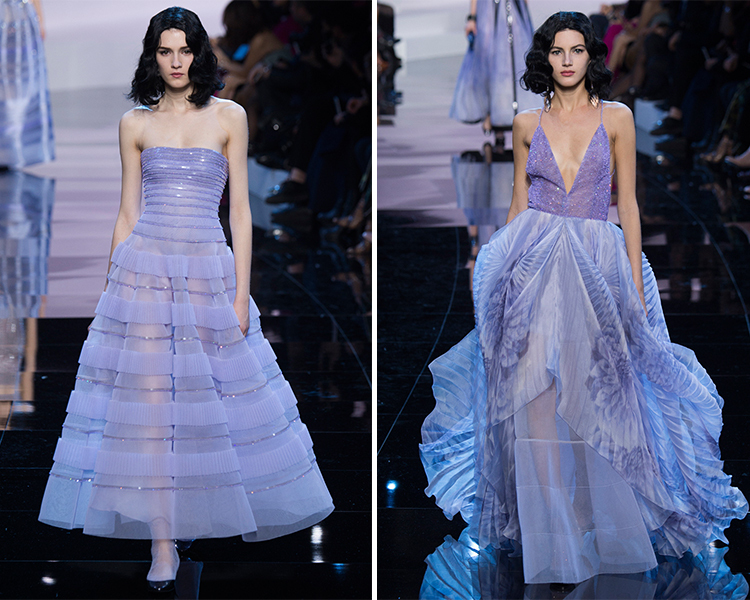 Get used to lavender, because I have a feeling a lot of these dresses are going to pop up on red carpets. 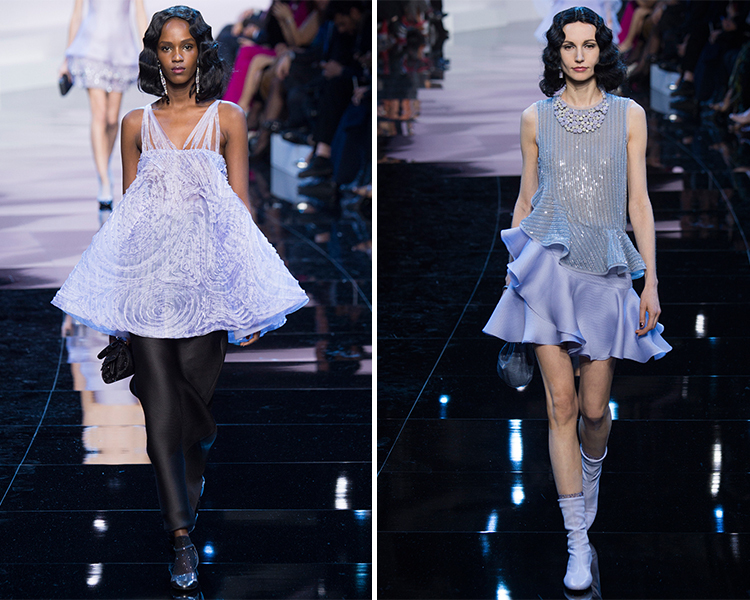 Armani wasn't afraid to be inventive with shape for Spring 2016. 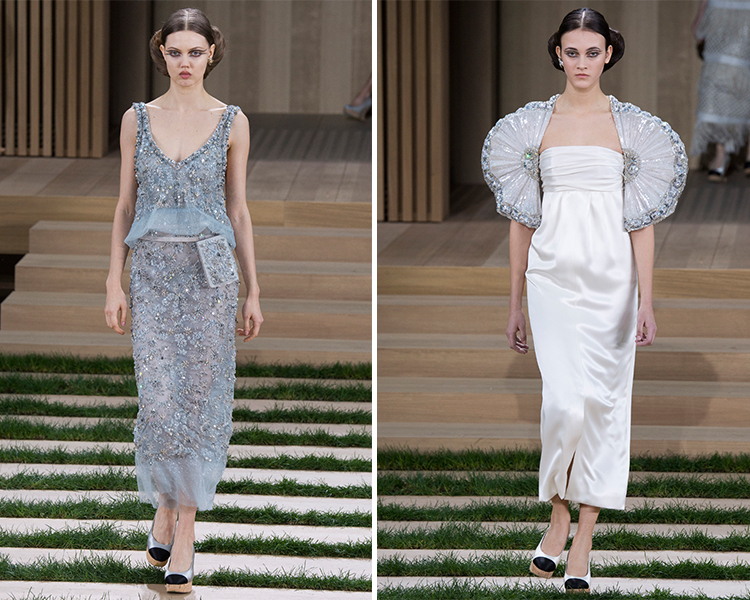 Dresses ranged from slip-like and slinky to tented trapezes. A favorite look of mine featured sheer pants with ruffle hems. The model's legs looked like elongated jellyfish, and I mean that in the most flattering of terms. I always find pants a bit boring, but I've never seen anything quite so fun! Here's hoping someone is brave enough to pull those off in real life! While it is absolutely impossible to hate Chanel or Karl Lagerfeld, I've made it no secret that I've found the past few collections to be derivative. When working at a heritage brand this is often the case, as designers feel an obligation to study archives and pay constant homage to the founders. 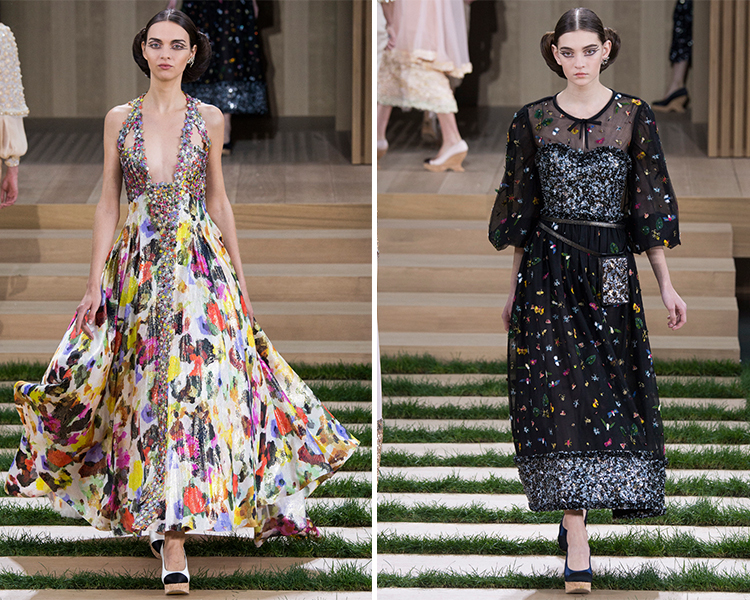 Thankfully, Lagerfeld has returned to form with a couture collection inspired by Japanese gardens and nature. For the most part, the entire collection was light and earth-toned, and everything felt very natural and rounded, even though the whole point of couture is to celebrate man's craftsmanship, the manipulation of nature, if you will. The models appeared like goddesses of the earth, slender and sophisticated in their columnal skirts, but with an otherworldly quality, highlighted by dramatic, anime-like eye makeup and glimmering sequins. Slung around their hips were tiny pouches, beaded with wood or sequins or pearls, and they looked like they could equally be pulling out an iPhone or dispersing seeds onto the dirt. 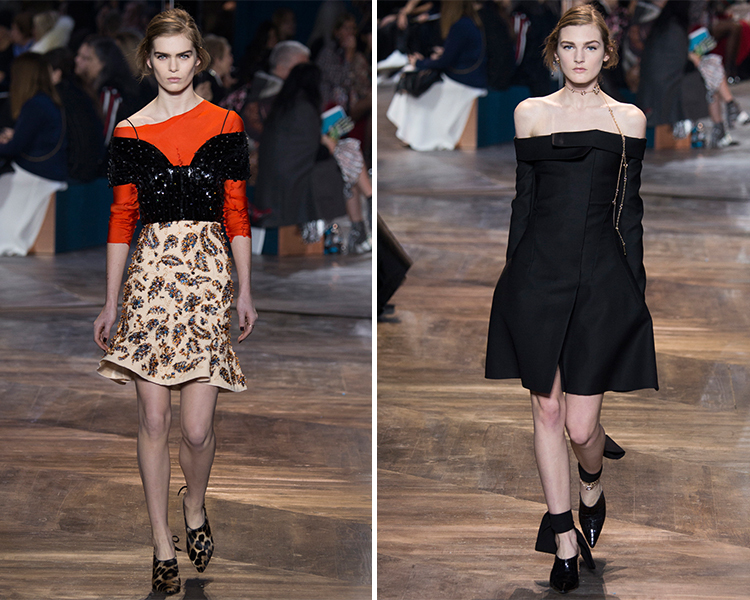 As always with Chanel, the devil is in the details, and this season was no exception. 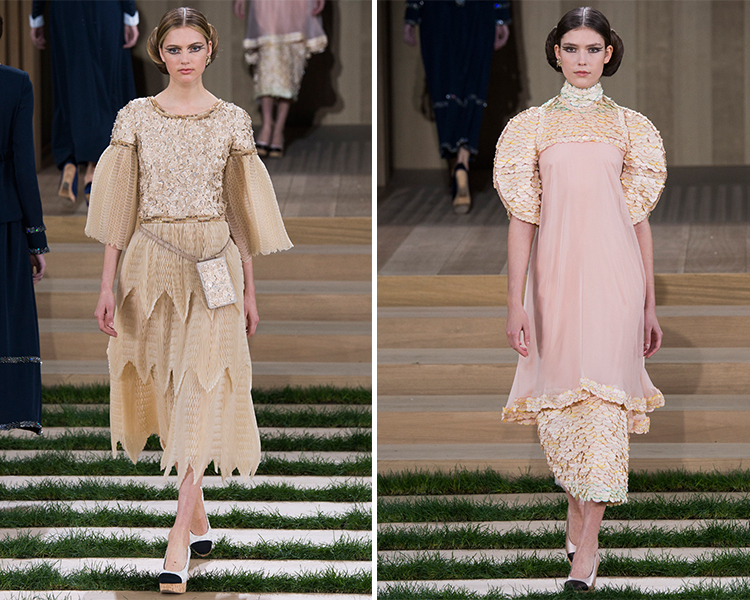 Materiality is always a concern of Lagerfeld's, and seeing as how the theme of the collection was "nature" he incorporated wood chips, wild cotton, and other natural materials into the clothes themselves. 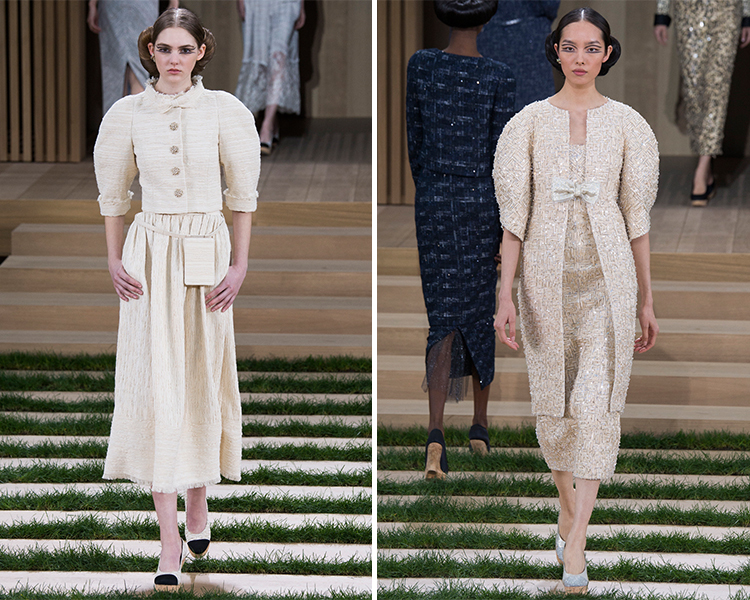 The clothes themselves were alive and natural, a beautiful sentiment in a time of hypertechnology and synthetic materials, especially since just last season the Chanel girls were catwalking down the most fashionable airport terminal ever. 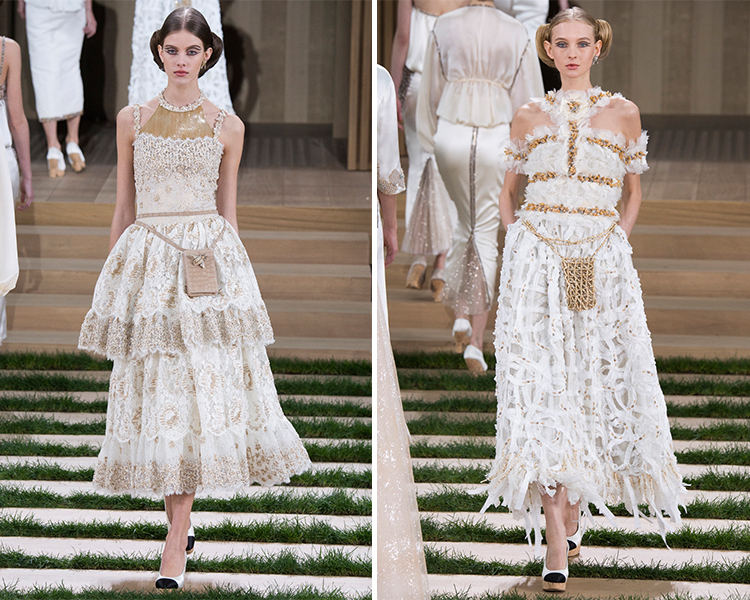 But leave it to Chanel to do a complete 180 and celebrate the very opposite of nature the next time. Also, when I get married I want a hooded couture sweatshirt like the Chanel bride. Seriously, how cool is that!? Like all of you, I too was nervous to see the Christian Dior collection after Raf Simon's premature exit from the fashion house. Would it be another post-Galliano Bill Gayten disaster? Please, don't let that happen! 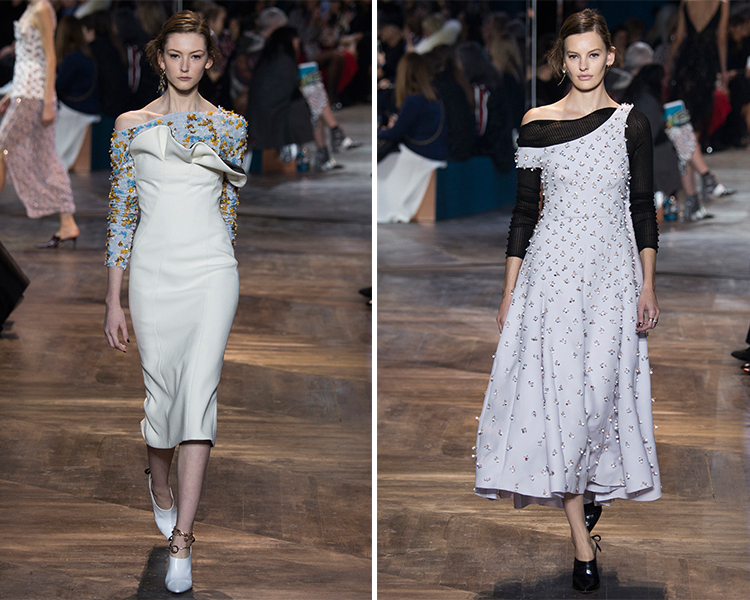 Luckily, countless fashion insiders (and myself) breathed a sigh of relief as the Dior design team presented a lovely collection that continued the youthfulness of Simon's tenure. There were fun, asymmetrical shapes, beautiful beading and embellishment, and an inventive view of color mixing. There were also plenty of youthful touches, from flirty mini skirts to back-from-the-90s anklets (that's right, they're making a comeback). Personally I hated the shoes, but they're in the same vein as the ugly-cool Céline shoes that everyone is obsessed with. My two favorite looks were the embellished bar jackets with slitted bell sleeves. 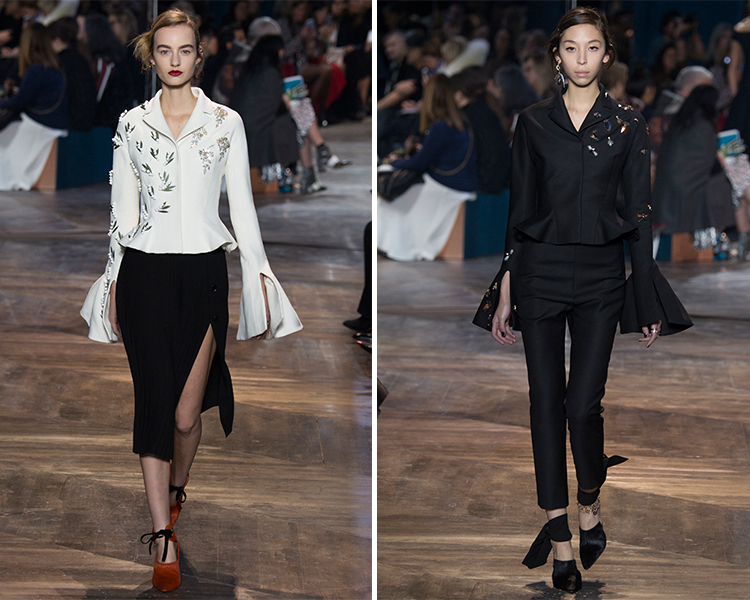 The bar jacket is a Dior classic, and I love how the designers updated this archival style for the modern day. As we await news on who will replace Simons permanently, we can be comforted by the fact that the interim design heads will turn out perfectly fine collections. 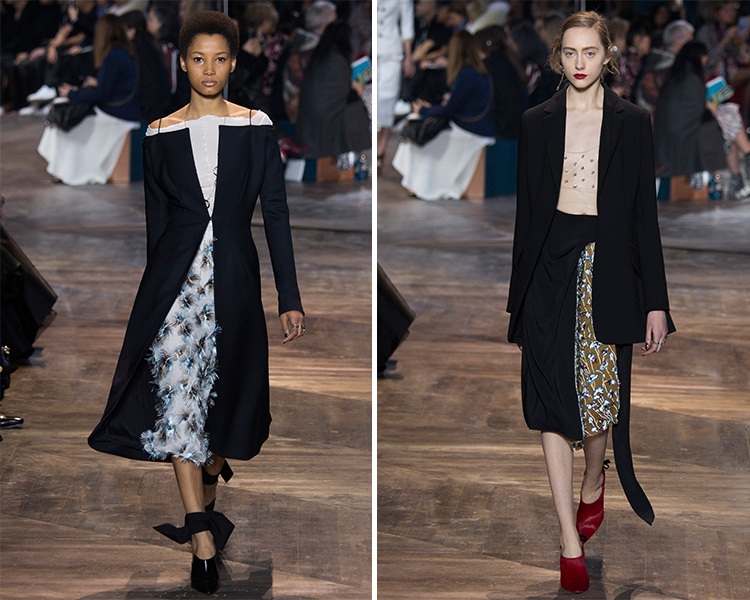 But seriously though, who do you think will take the reins at Dior? 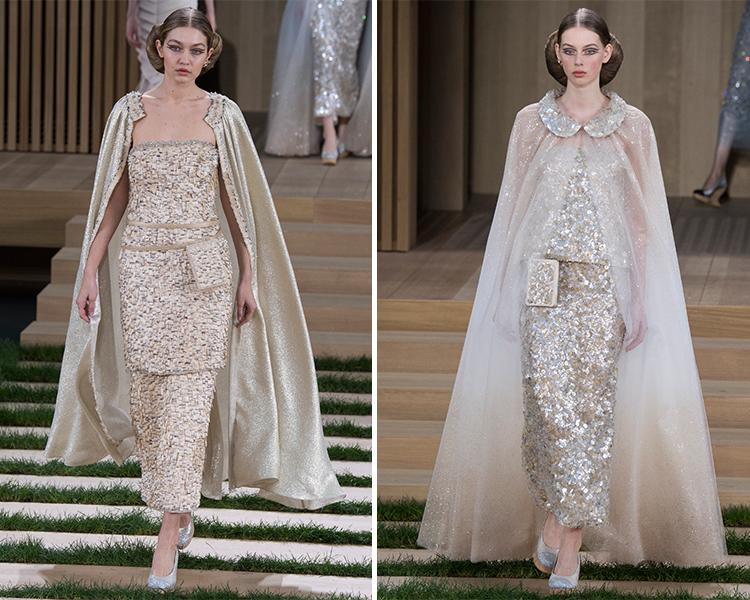 What was your favorite couture collection? Let me know in the comments! Aren't they? Couture is my favorite for a reason! Thanks for reading! I agree, I think Raf definitely had a lot more to give to the brand, but if he was feeling stressed out and overwhelmed, that's not good for anyone, so as sad as I was to hear it, I understand his decision to leave. BUT luckily, this collection was pretty good, all things considered! I think Christian Dior as a fashion house has found a new direction that Raf established and now they can continue with, so it won't be like the designers are left without a sense of the brand's identity. I'm excited to see who they get to become the next head designer, though!